Round Rock High School teacher Tiffanie Harrison, Hernandez Instructional Technology Specialist Natosha Daniels, members of Round Rock ISD’s Black Student Unions, and members of the Round Rock Black Parents Association will participate in the ‘It Takes A Team’ Design Collaboration with the San Francisco-based Teachers Guild. This challenge was in response to a call for designs to strengthen the partnership between families and schools so that students can achieve their dreams. The challenge included over 100 design ideas submitted from across the nation. 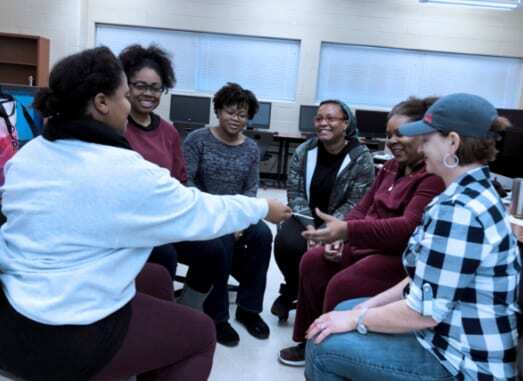 The Round Rock ISD teachers along with the Round Rock Black Parents Association, led by Tanjour Bowman and Keiwanna Pitts, will attend the “It Takes A Team” convening in San Francisco on April 17. During this convening, they will receive funding and support to build on the ideas and share their knowledge with the national community that is The Teachers Guild. Additionally, the developed collaboration will include a focus on improving equity awareness and inclusion in Round Rock ISD. The Teachers Guild believes that when families and teachers work together, anything is possible. Funding and Support for this opportunity are provided in partnership with the Carnegie Corporation New York, IDEO, Learning Heros, GreatSchools.Org, and EdSurge. Vote for and comment on their submitted ideas on The Teachers Guild platform.